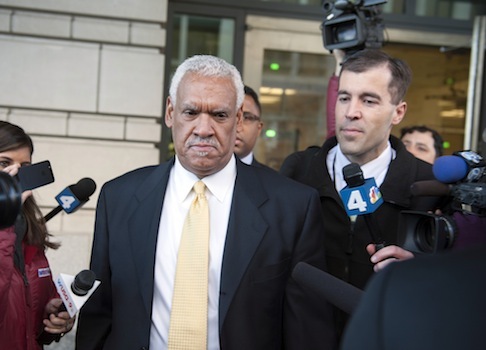 District of Columbia businessman Jeffrey Thompson, who federal prosecutors say financed a "shadow campaign" for D.C. Mayor Vincent Gray in 2010, pleaded guilty to conspiracy to violate campaign finance laws. Thompson claimed some of the candidates, including Gray, were aware of the illegal fundraising. According to prosecutors, Thompson funded a $600,000 shadow campaign "in coordination with and in support for a federal candidate for president of the United States." The charges did not name the candidate. Last September, the Washington Post reported that Thompson allegedly paid a marketing executive "more than $608,000 to hire ‘street teams’ to distribute posters, stickers, and yard signs beginning in February 2008 to help raise Clinton’s profile during her primary battle with then-Sen. Barack Obama." The marketing executive, Troy White, pleaded guilty last September to a misdemeanor tax charge related to Thompson’s alleged illegal campaign financing. According to the Associated Press, Clinton aide Minyon Moore was identified as the conduit between the Clinton campaign and the illegal financing effort. A spokesperson for Hillary Clinton did not return request for comment. In a court hearing on Monday, prosecutors said Gray was aware of the illegal shadow campaign, and agreed to refer to Thompson as "Uncle Earl" in order to hide his identity. Thompson was also charged with making illegal contributions to U.S. members of Congress and D.C. City Council members, who are not named in the indictment. Thompson is facing up to six months in prison under his plea deal. Gray’s campaign objected to the prosecutors’ focus on the D.C. mayor, and said Thompson’s claims that Gray knew about the scheme are not believable. "We’re talking about millions of dollars [Thompson allegedly distributed] to subvert democracy, including a presidential election, an historic presidential election," Gray campaign manager Chuck Thies told the Washington Free Beacon. "It’s dumbfounding … I think he should spend a decade or more in prison." "The message to people who seek to skew the outcome of a presidential election is ‘eh, if we catch you you’ll get six months in jail,’" Thies added. "It’s a frightening message."